Mission-critical documents from ROTASET are printed and encoded to the highest standards, using expertise gained over 35 years in modulus numbering. Our reputation for the most complex modulus numbering ensures trouble-free input for documents. Modulus or Check Digit numbering is yet another security feature which can be applied to forms products – both in continuous and cut-set format. The basic serial number of a document has a prescribed algorithm or formula applied to it in both the numbering process and also in the users’ Data Processing department. According to the complexity of the algorithm applied to the base number so varying degrees of security of data entry can be achieved when keying-in data from forms in use in an organisation. By using modulus numbering you can make savings in input times and re-checking of data and identify keying-in errors such as transpositions or mis-keyed entries. The options available include simple un-weighted number systems to complex, weighted, multiple check-digit systems. 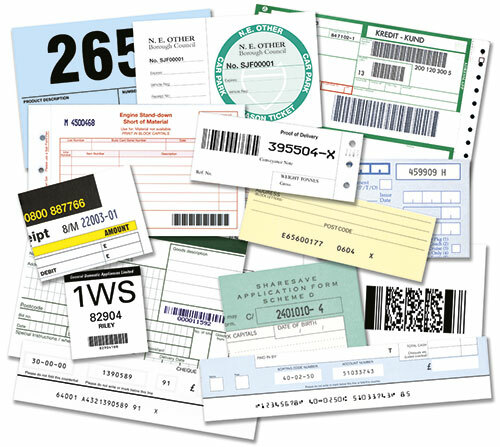 In addition, these can be incorporated using our range of shuttle-matrix, impact, inkjet and laser printers into barcodes and JUMBO numbers as well to give a real ‘belt and braces job’! This is a very complex subject and we will be pleased to discuss your specific requirements for the incorporation of modulus numbering and barcoding. Call us now on 01507 472473 or contact us. Various character formats from the smallest to JUMBO! Modulus algorithms can be integrated into the majority of barcodes as well as the barcode’s own integral check digit when needed.